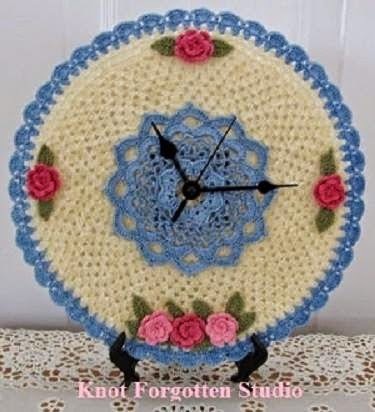 Penny Freshour caused a sensation when she posted a picture of an amazing crocheted clock she had created in the Threadies Facebook group last week. Everyone loved the clocks, and wanted to see more. Penny not only posted more pictures of her clocks, she shared step by step instructions on how she made them. She has also kindly allowed me to post her pictures and instructions here on the blog. Penny and her husband live in the Colorado Rockies. He is retired from the Air Force and she is a retired Home Health Care Provider. Since retiring, they enjoy traveling, crafting and fishing. Penny has been crocheting for almost 30 years now. She taught herself to crochet with thread by subscribing to the Magic Crochet Magazine back in the ‘80’s. 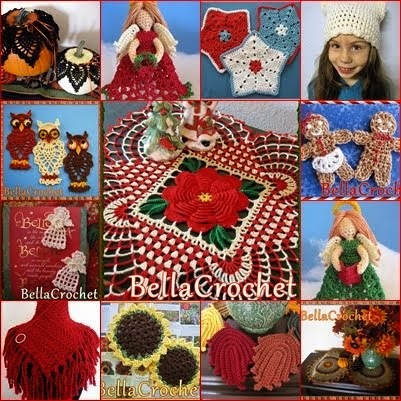 Penny was inspired by her great-grandmother who crocheted beautiful heirloom doilies. The doilies were passed down to Penny and other family members after her great-grandmother passed away. Penny admired her work so much that she wanted to honor her by making doilies of her own. Penny feels thread crochet is in her heart and blood! Here are the clocks I made earlier this year. Maybe you'd like to try your hand at making one or ten! (hehe!) They would make lovely Christmas gifts. The clocks are Mainstays brand and can be purchased at Walmart for $3.88. Such a deal! Heck, you can't even buy the clock works by themselves for anywhere near that price. The clocks at my local Walmart come in four colors. White, red, black and a royal blue. Here's how I made mine: First you'll need to make a small doily. No larger than 6.5 inches in diameter. Note: When making your doily you will need to make sure that the starting center chain is large enough to allow the clock mechanism to come through. You'll also need some edging approximately 23 inches long. It should have at least 3-4 rows to it, if not more. The first row won't show because it's going to be hidden under the clock rim. After I chained my edging length, I double crocheted the first row. That row is going to be glued under the rim of the clock and won't be seen. You will need some clear drying glue for that and for the doily and paper backing. I use Aleene's Tacky Glue. Now you'll need to take your clock apart. Take the screws out of the back and remove the rim and the glass. 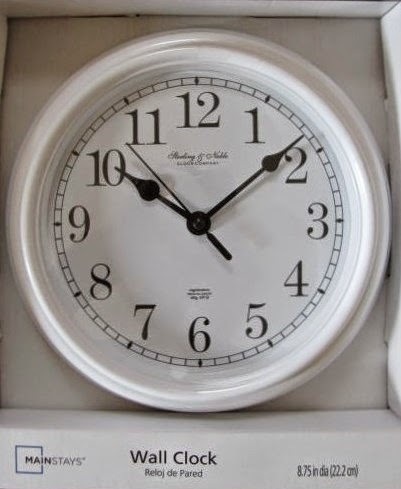 Carefully remove the hands of the clock by gently and evenly pulling them up. The back of the clock will remain in place. Now you will want to remove the paper backing that has the numbers on it. It's just tacked on and should come off easily. Keep it and use it as a template to make a new or different colored backing if you'd like. 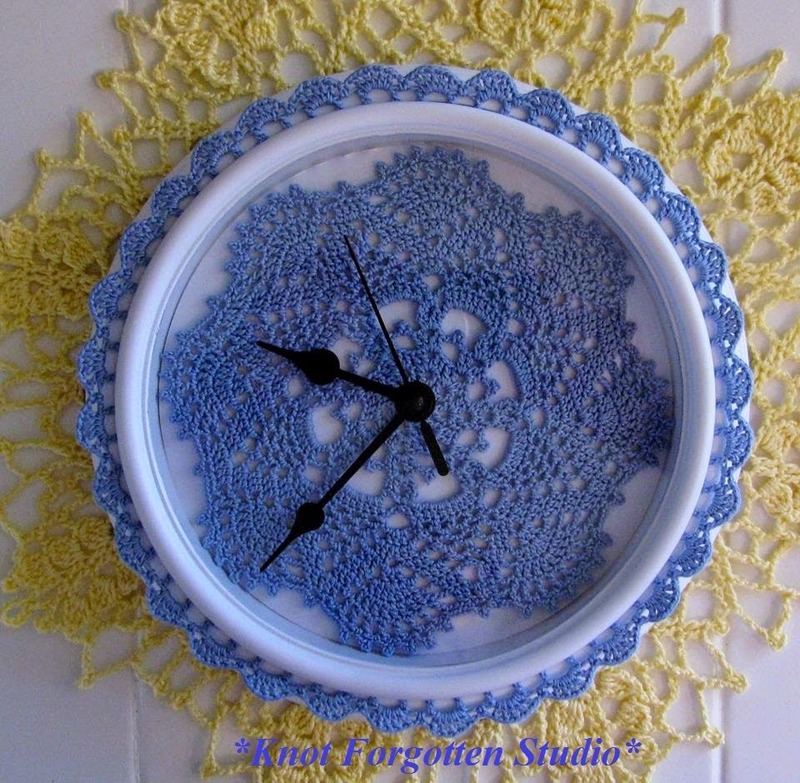 To add your doily and reassemble your clock: Lightly glue your paper backing onto the clock. 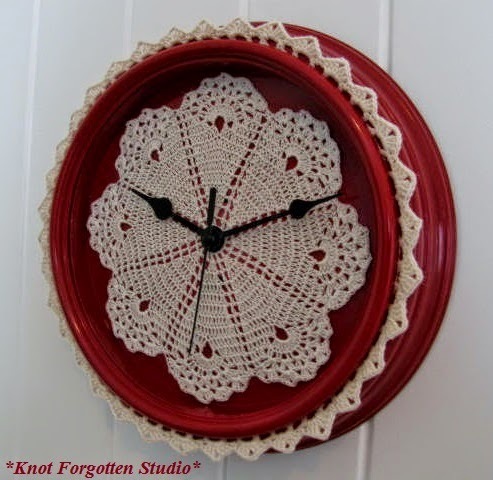 Insert the center of your doily onto the clocks mechanism and glue lightly around the edges of the doily. Replace the hands of the clock. You may need to carefully bend/adjust the hands slightly because the thickness of the doily may hamper the movement of the hands. It's easy to do. Next you'll need to glue on the edging. After all is dry, put the glass and the rim piece back into place. Put the screws back into the back of the clock and add a battery. TaDah!! Thank you so much, Penny! Now I am off to Walmart to get a few of those clocks! All photos are used courtesy of Penny Freshour. What beautiful ideas for Christmas gifts! Now I have another reason--or two--to stop at Wal-Mart on the way home. These are so pretty. Thank you for sharing and for Penny's lovely idea. Thank you for sharing such a great idea. My daughter's will love this.